A new Creative assistant, Creative Account Manager, as well as a new PR and Marketing Manager will help open communication pathways with clients at the same time as boosting the quality of all output. “We felt that the time was right to inject some new ideas, new knowledge, and new skills into our already amazing team. We are now more diverse than ever, we challenge each other more creatively than ever, and we support our clients with more knowledge than ever before” said Jenny Stanley, M.D. Monika Šumska will assist with all things design throughout the company, she comes with a passion for design and a promise to not let the company get away with anything but the highest standard. "I'm pretty much a self-taught content creator with a bachelor's degree in interior design from Lithuania, a small country in Northern Europe. I love to travel and I've had the pleasure of living in Portugal, Spain, and Italy. " Jay Blanco has come in to watch over all things production and be an approachable and technically gifted contact for clients. He will blend his excellent customer facing skills with his knowledge of all things code related to give Appetite a more authoritative voice when dealing with clients. "Technology is the future and I want to be part of it. 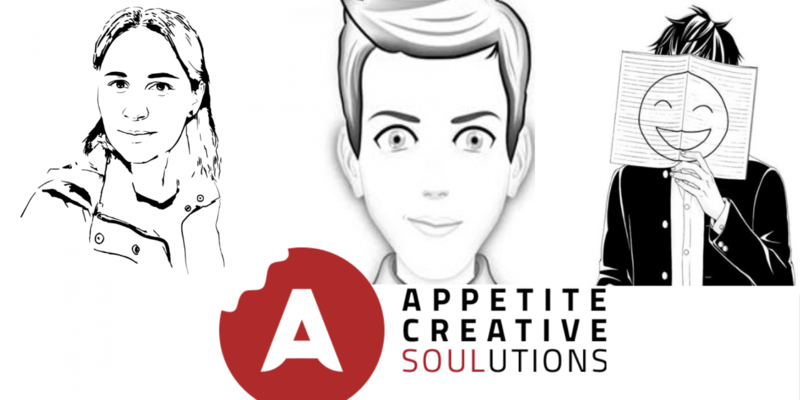 My new journey has just started and I’ve come to Appetite Creative to learn, build, and create amazing things for a fast-growing and promising company." A new, ever more ambitious team has arrived at appetite, and they indeed have turned up hungry. With eight nationalities and thirteen languages across three offices, this move further increases and hammers home the real diversity that Appetite encourages, fosters, and champions.